Very cool pumpkin. Well done. I think I am close to being the only person on the planet that thinks Halloween – All Saints Evening – has been hijacked and used by unsavory people to train innocent kids as demanding, forceful, future vandals that terrorize people in the streets. They are attired in costumes that hide their identity and are in fact designed to intimidate regular folk in their own homes. They are willingly taught by parents that it is alright to travel around their neighborhood demanding favors, sweets – which we all know to be extremely bad for youngsters teeth. If their demands are not satisfied they are then obliged to provide a Trick. In the future this turns into hand over your wallet/purse or you will be beaten until and inch of of life. Oh and do not forget to smile as you hand over your wallet/purse as you were part of the training that appears to have been absorbed and put into practice. Well done everyone, pat yourselves on the back. Civilization is collapsing due to the training that we provide. Looking forward to carving a pumkin with my son, especially as we grew the pumpkin ourselves this year. Beats Christmas, where we’re taught to give people we can barely stand presents that require no thought whatsoever out of moral obligation. Just to make sure we don’t forget, we have Gregg Easterbrook’s Unified Field Theory of Creep. A 2-ounce chocolate bar is a lot less expensive as well. Your pumpkin carving skills: Sub par. Oh Matt, your recent Panda Update was far more scary than any pumpkin you could carve! Quality piece of carving there Matt. Like your style. You’re just missing the eyes! Good Job Matt except you carved it out sideways DOHHH! Nice one – tried pumpkin carving for the first time this year (its not so polpular over here) and got good results. 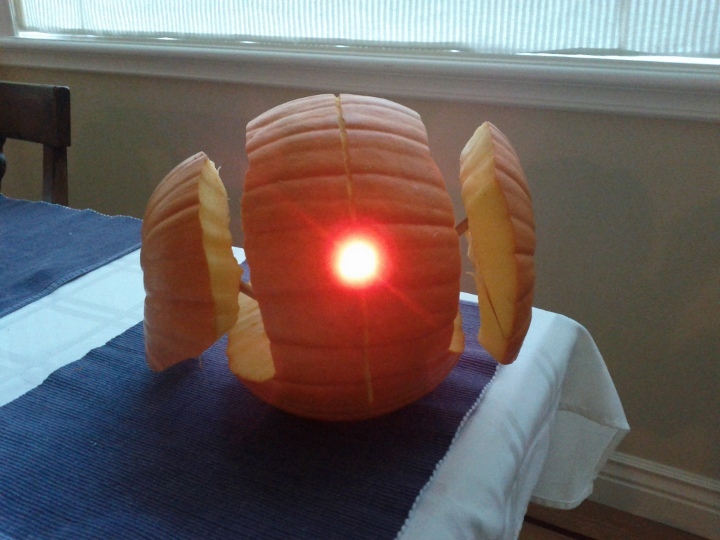 what I especially like about your pumpkin is that you use a LED for lighting it. I ran into trouble when I put a small candle inside it smoked the whole area around the house as the cap cought fire. Much to learn over here. Hey that’s cool 🙂 Great Pumpkin! That is fantastic, Matt! I rarely am able to achieve something that is little more than a pumpkin with two holes in it! Happy Halloween! This looks brilliant Matt, very creative! i have been doing alot of SEO work for companies with a Halloween themes and i will have to show this to them. That’s wicked! Pretty bright LED, How did you get the sound? Nice work, We don’t have very many pumpkins here in Ireland. Haloween or not! When are you in Toronto? @AJ Wilcox and maybe incorporate one of those usb contolled rocket shooters into the side pods. Matt what’s wrong with you , I thought you are more creative than what you did . Happy Halloween from London. Nice Matt…seems you have some fun. Hey pretty good Matt. Good to see the spirit of Halloween is still alive around the Googleplex. Maybe today’s search engine results will either be a trick or a tweak. (ok that’s not a very good pun but having howling fun regardless …) Happy Halloween! Very innovative! thanks for sharing…. ← New 30 day challenge: going vegan!